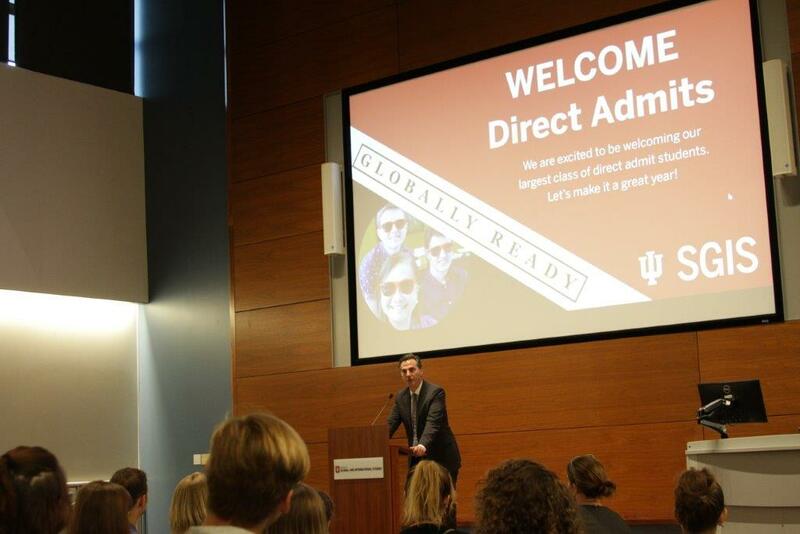 A week ahead of the official start to the fall semester on the Indiana University Bloomington campus, the 2017 cohort of Indiana University School of Global and International Studies’ Direct Admit Scholars was off to a running start. SGIS Dean Lee Feinstein welcomed them in the Global and International Studies building auditorium, noting that each of them received a copy of the United Nations Charter, something he told the DA students should have particular significance for them. “You are our next generation of global citizens, who reject appeals to turn inward, who look at the world pragmatically and with an open mind, and who understand and support the principle that America’s future is global, and that engagement in the world is essential,” Feinstein said. He said that commitment makes them the successors to the representatives of 51 nations who signed the charter in 1945. The group of 137 filled all of the available seats throughout the building’s atrium, Global Lounge, and adjacent hallways for lunch with faculty and administration. 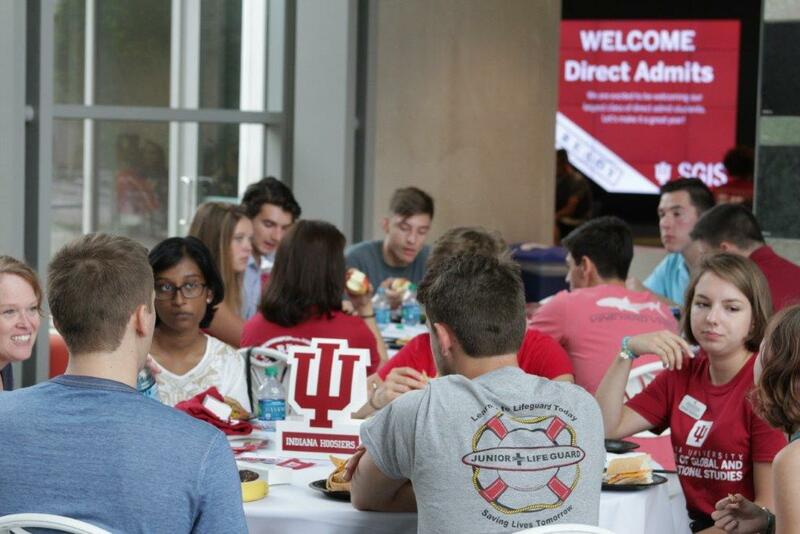 Three times as many students accepted invitations for direct admission to the school this year as last, and they came to IU from seven countries and 21 states. The new freshman graduated at the top of their high school classes, with an average grade point average of 4.0. Having indicated a major within SGIS on their IU applications last fall, these accomplished students were offered direct admission to the school. The opportunity allows them to focus on their major immediately, and declare a second major -- or a minor -- at the same time. The program offers a $2,500 one-time scholarship and specialized programming. Hailing from Brazil, China, Korea, Kazakhstan, India, Canada, and the US, the new Direct Admit Scholars will be majoring in all four departments of SGIS: Central Eurasian Studies, East Asian Languages and Cultures, International Studies, and Near Eastern Languages and Cultures. They’re tackling 16 different languages, over half of them the less commonly taught varieties, including Mongolian, Hindi, Korean, and Turkish. Nine of the most intrepid Direct Admits will be studying two languages in their first semester. As diverse as their academic interests are the students’ backgrounds. Four are first-generation college students. Four took International Baccalaureate diplomas from their high schools. The class boasts five Army ROTC cadets, members of the Marching Hundred band, and a rower. Thirty-three Hutton Honors students are represented, and 8 Hudson Holland scholars.